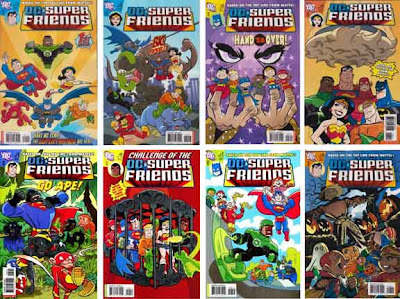 I reluctantly picked up copies of DC’s SUPER FRIENDS after they had been on the stands for a few months. My reservation was due mostly to the squat and thick artwork of the characters; the art just did not appeal to me. Funny thing about teaching. It’s not necessarily about what I find appealing, what I am drawn to. The key to reading motivation, as supported by research, is that children have choice in what they read. My comic book guy slipped a copy in my weekly bag, thinking I neglected to order it from him. I bought it and took it home, having low expectations regarding the reactions. I gave it to my daughter and she immediately nabbed it from my hands and took off for the bedroom. When she was done I asked her what she thought. “They look like action figures,” said Sophie. What I saw as overly cute and childish, she connected with her toys – a text-to-self (or in this case a text-to-toy) connection. You know, it says so right on the cover that this comic book is based on the toy line. Incidentally, that is an odd statement as the toys originally came from the pages of the DC Universe comic books. I didn’t give the book a fair shake. I did what educators sometimes do. I viewed the title from my eyes, when what I should have done was considered the book from a child’s perspective. I ended up going back and buying all the back issues. Sophie loved the book so much that I signed her up for her own subscription. So now I have my classroom copies and she has her own copies. I love it when I learn life lessons from an 8-year-old. It keeps me young and puts that ego in check. There’s no getting too big for your britches with a precocious third grader around. She sees those warts and does not hesitate to point them out. With that said, what about the writing of the book? It is young – very young in fact. The stories are morality tales focusing on being good and doing good. The entire package is wrapped in short action sequences, with frequent breaks in between – just enough time to do a game or puzzle, riddle or joke which is conveniently included. It’s a response to students with short attention spans. For those looking for wholesome values-based stories, then this is just right. It’s not a title that I think will appeal to the majority of older elementary-aged students. I think those students will prefer more complex and deep themes. However, the reading level is not too young with words like earthquake, cavern, experience, difficult, android, programmed, abilities, and debut. For students who need solid vocabulary and linear stories, then SUPER FRIENDS fits the bill. The Super Friends are presented with problems and must make decisions on how to approach and solve those problems. This series could be used as choice exercises, where students are given a problem and asked how to solve it using reason and logic. Student answers can then be compared and contrasted with the actions of the super heroes. SUPER FRIENDS fulfills a purpose for some students and is more appealing to kids than I thought.